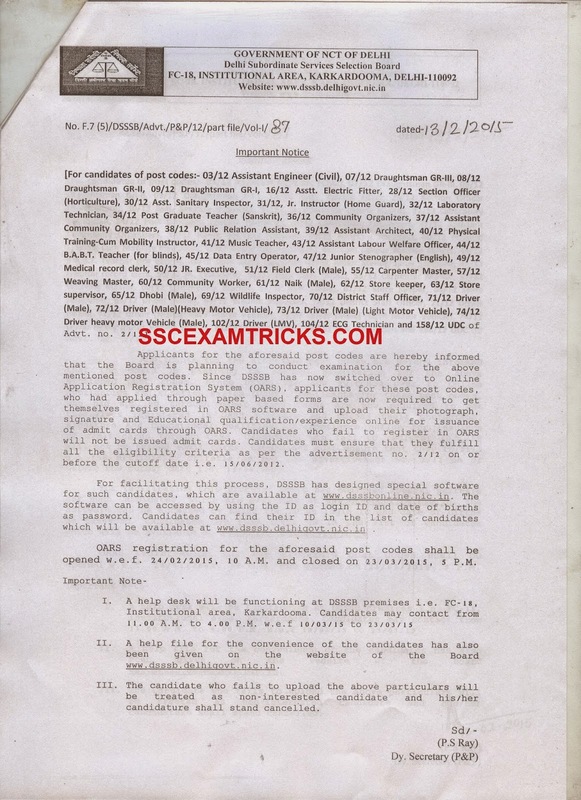 Application registration System ) from 24th February 2015 at 10:00 AM to 23rd March 2015 at 5:00 PM on the official website of DSSSB. DSSSB has also designed software to such candidates which are available at www.dsssbonline.nic.in . The software can be accessed by using ID as Login ID and date of birth as Password. The candidate can find ID from the list of candidates which will be available at www.dsssb.delhigovt.nic.in. In any kind of confusion or query, candidates may contact to DSSSB help Desk i.e. F-18 Institutional Areas, Karkardooma from 10th March 2015 to 23rd March 2015 in between working hours i.e. 11:00 AM to 4:00 PM. sir,for your kind attention this is to bring in your kind notice the i had applied for the post code 36/12 in the year of 2012,that time head copy was submitted but still i did not get any messages regarding exam schedule,recently i come to know that online application were required by dsssb. sir plz solve my problem can i appear in exam on 21/5/17?